I´ve been using the new wallart suite for two days and I´m loving it. Just testing and playing around with it before we start using it for real in our website. BUT theres a couple of things that are busting my .... head. Also we do not use decimals on our prices, always is a round number. When I try to set the price on my substrates, I use round numbers, but on the designer it shows me another price... Heres a Picture. Why does this happens?? How can I fix it? Also, Is there any chance to use a . (dot) to separate thousands? I really hope somebody... out there... can help with this. There’s a bug between pricing set inside HP WallArt Suite and Designers pricing. Right now our development team is already working on it to fix it as soon as possible. I´m having differences in pricing between the old suite and the new one. I dont know why is this, any idea? Than you for your feedback. We've found some mismatching related to pricing. Right now they're working on it to provide a solution to the issues you're experiencing. I'll come back to you once everything will be fixed. It seems that I´m gonna have to upgrade my RIP to 10.1 (Caldera) to be able to use the wallart suite, but it seems you have too many issues or bugs with the new suite, so I´m not very happy on doing the upgrade if the suite is not ready to go. You still have pricing issues on the suite. do you know when bugs will be fixed in the new Wallart ? Can we switch back to old version..without any problems later in switching back.in order to hopefully have it working until the new version works ? The HP WallArt Suite team is working on adding decimals to the price options and also using dots "." as separation will be included soon. 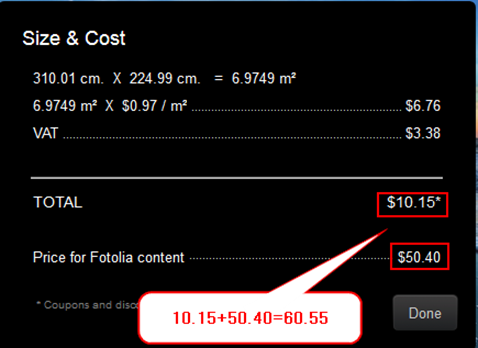 Fotolia pictures are now more expensive because the price includes the VAT (value added tax) directly to the price. 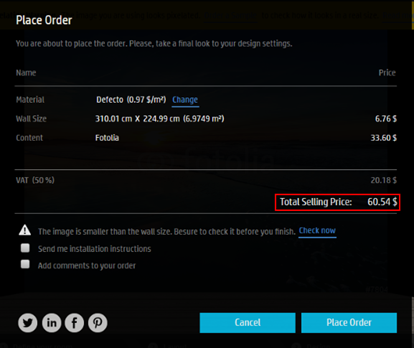 HP WallArt Suite is working on offering the VAT amount separately. They will add the option to enable/disable the Multiwall and Augmented Reality as desired. Krimat: You can continue using the old version as long as you haven't upgrade your RIP version yet. This changes are expected to be implemente soon. I will update you once the changes will be applied. I´m still trying out the new wallart suite, and I can see you are making a couple of changes to it for good. Here you can see the price bug is fixed, but the price still show two decimals. Also, will there be an option to avoid the use of decimals? At least for the southamerican market. I hope I´m not being a pain in the neck with all this things about the new suite, we love the wallart suite, but the new changes are killing us if they are not friendly with our costumers. Pictures too small, sorry, here they are, in order. We are looking forward in order to include the option that will allow PSPs to swap between on a numerical system to another. We’ve reported this issue in order to have consistency on the calculus that are posted to end-users. Right now the system is designed to allow users to design under a custom area to fill with Wallcovering, Canvas… having an area without a fractional part could limit the usage of the tool for end-users. As you can see, thay are working on this issues. I guess thay are going to release a solution to them in an update soon. Amazing, thanks for the reply. Any news on the new wallart? In one month we will have to start using the new wallart and it still have a couple of details, when will it be 100% ready? We constantly improve and enhance HP WallArt Suite in order to embrace all of our customer requirements, some of them are not obvious or visible but they definitely improve PSP and end-user experience. We encourage you to login HP WallArt Suite in order to double check that everything meets your requirements otherwise please leave your comments. In this video you can see that, even when the price is set to have no decimal, wallart still show the price with two decimals. 0:56 - The pricing still shows the two decimals, the price was set without decimals but wallart still show two decimals. 1:06 - Price per sq. meter with two decimals. 1:13 - Wall size was set to 3,1 meters by 2,25 meter. Wallart shos decimals again. 1:24 - There should be an option so no decimals are shown in the final price for the wall. 1:32 - Pricing is not the same, in the old wallart suite the price was cheaper, will the price for the pictures from fotolia be more expensive in the new wallart? 1:50 - In the old wallart suite, when the order was placed, the client was redirected to a thank you page on my website, even though now in the setting you are asked to put a thank you page URL, wallart does not redirecto you to that web page. I´m checking regularly the new wallart to see the improvements, and for the moment, those are the comments I have. Looking forward to start using it, but we will need to know if those details will be fixed or will be stay at it is so we can see how we can use in a way is easy to use for our clients. Thank you for your feedback. Unfortunately it´s not possible to remove decimals either the price or size right now, however we are working on to fix this issue, we apologize for any inconvenience. In order to redirect to a website when you closes the designer you have to add the URL in your HP WallArt account: Settings > System configuration. Hey Marc, no problem, theres no inconvinience yet just testing and reporting the things I see in the new wallart suite, I hope Im not starting to be a pain in the.... neck. In a future, the decimals thing will be an option or do we just have to adapt to have the pricing with decimals? We are starting to get everything together to be able to use the new suite, new RIP and new sales strategy in our company because we think is an amazing feature to have for our clients, we are even going to drupa to see the new LATEX and other things that can help us to grow even more. Its been like a month and we cant use the new wallart suite yet, we already did the RIP upgrade, but the new wallart seems to not be doing any improvement, now, after trying the wallart app for ipad, We can still see the exact same problems we have pointed out since day one, and new ones too. Finally we get the price right on the desktop version of wallart, no "ghost" decimals. Thats great. We have our material options duplicated. Prices shows the "ghost" decimals... Why is this happening? Can it be fixed? I tried to see in the setting options of wallart if theres a way to fix it, but couldnt find it. Then we go to the quotation part. And then again, the multiplication here is wrong. Will this things be fixed anytime before we HAVE to do the new wallart suite? Thank you for your feedback. I've sent it to the HP WallArt Suite's team and they are working on it. they said it will be fixed in the new update (do not know the exact date).